Two years ago today Tero “Camu Tao” Smith died after a grueling battle with cancer. He was a friend, a son, a brother, a groom to be and last but not least a brilliant producer, singer, rapper and entertainer. Words can not express the heartache that has been felt in the wake of his passing by those who loved and respected him. 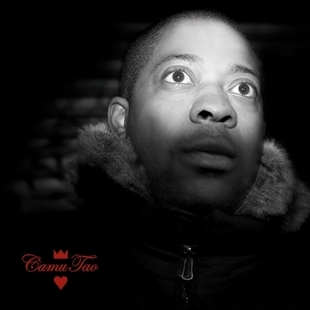 This summer, on August 17th, Camu Tao’s first and final solo album KING OF HEARTS will be released by Definitive Jux in collaboration with Fat Possum Records. In conjunction with this release we will also be giving away (for free) the 2005 Central Services (Camu Tao and EL-P) ep “Forever Frozen In Television Time”. In many ways KING OF HEARTS is a record of what could have been, a snapshot of an artist mid-evolution. In some ways its a diary discovered in the belongings of a friend who passed away. Or maybe it’s a scrap book of a master inventor with only half of the schematics of some incredible new invention detailed inside. You don’t need to see the invention fully realized in order to recognize the magnitude of the creative force behind the sketches. For those of you who know, i don’t feel like I have to explain to you how important the release of KING OF HEARTS is. He was, as i’ve said before, the secret none of us wanted to keep. He is a legend. For the many of you out there unfamiliar with Camu and his work: we’ve written a bio/press release as well as collected some of his music as well as a world premier off of KOH called “Perfect Plan” which I’m putting below. I only ask that you take a little bit of time out of your day to investigate. Don’t let yourself be closed off to this mans music simply because you haven’t heard of it/him before. Getting his amazing, weird, raw and original music heard is all he ever wanted. We only ask that you give him that chance. I believe you’ll be happy you finally discovered the world of the King Of Hearts. I know for the many of us who loved and respected him that knowing Camu and his music changed us forever. What we hope happens when you hear King Of Hearts is that you feel the way we feel; This music (even in its raw form) is some of the bravest, most surprising, inspired, and (now more so than ever) poignant material around from an artist who was only beginning to tap into his potential. It’s a raw reminder for his fans, friends, and family of how special and off the wall his energy was, and yet it sounds nothing like anything he’s ever done before or has previously been known for. In fact, I don’t think its over the top to say that what Camu was doing sounds like nothing before it because I know for a fact that there was never anyone like Camu before him. There won’t ever be another after, either.